September nights 2018! Planets bright! Milky Way sights!! What’s Up for September 2018? Set your sights beyond the solar system, and take a late summertime road-trip along the Milky Way. The waning days of summer are upon us, and the sun sets earlier, revealing the starry sky bisected by the Milky Way. While waiting for the Milky Way, check out 2018’s outstanding views of the planets! You’ll have to look quickly after sunset to catch Venus before she sinks in the West below the Metchosin Hills. And through binoculars or a telescope, you’ll see Venus’s phase change dramatically during September – from nearly half phase to a larger thinner crescent! Jupiter, Saturn and Mars continue their brilliant appearances this month. Look southwest after sunset over Port Angeles. Best view is from the short drive inside Oak Bay to the top of Mount Tolmie. Use the summer constellations help you trace the Milky Way. Sagittarius: where stars and some brighter clumps appear as steam from the teapot. Aquila: where the Eagle’s bright Star Altair, combined with Cygnus’s Deneb, and Lyra’s Vega mark the Summer Triangle. Cassiopeia, the familiar “w”- shaped constellation completes the constellation trail through the Summer Milky Way. Binoculars will reveal double stars, clusters and nebulae. Between September 12th and the 20th, watch the moon pass from near Venus, above Jupiter, to the left of Saturn and finally above Mars! Both Neptune and brighter Uranus can be spotted with some help from a telescope this month. Look at about 1:00 a.m. local time or later in the southeastern sky over Seattle. You can find Mercury just above Earth’s eastern horizon over Mount Baker shortly before sunrise. Use the moon as your guide on September 7 and 8th. And although there are no major meteor showers in September, cometary dust appears in another late summer sight, the morning Zodiacal light. Try looking for it in the east on moonless mornings very close to sunrise. To learn more about the Zodiacal light, watch “What’s Up” from March 2018. You can catch up on all of NASA’s current-and future-missions at www.nasa.gov. The Moon and Saturn meet Mars in the morning as NASA’s InSight spacecraft launches to the red planet on May 5. Some lucky viewers in Central and Southern California, and even into the coast of parts of Mexico will get a chance to see the launch of InSight–NASA’s latest mission— with their unaided eyes AND see the spacecraft’s destination, Mars, at the same time! InSight is scheduled to reach Mars on November 26, 2018. The window opens a few minutes earlier each day until 1:30 a.m. Pacific time on June 8th. This will be the first interplanetary launch from the West Coast. Mars shines a little brighter than last month, as it approaches opposition on July 27. That’s when Mars and the Sun will be on opposite sides of Earth. This is will be Mars’ closest approach to Earth since 2003! Compare the planet’s increases in brightness, with your own eyes between now and August! The Eta Aquarids meteor shower will be washed out by the moon this month. This shower is better viewed from the southern hemisphere, but medium rates of 10-30 meteors per hour may be seen before dawn. Of course, you could travel to the South Pacific to see the shower at its best!! There is no sharp peak to this shower—just several nights with good rates centered on May 6th. Give yourelf an hour to view meteors, as they sometimes come in spurts with lulls in between. Plus it takes about 20 minutes for your eyes to dark adapt. You don’t need to look directly at the radiant, the direction in the sky the meteors appear to radiate from. Instead, look away or even lie on the ground looking directly overhead. That gives you a wide amount of sky to watch comfortably. Jupiter reaches opposition on May 9th, heralding the best observing season for Jupiter viewing, especially mid-evening. This is when the planet is on the opposite side of the sky to the sun. In this position Jupiter appears brighter and even larger through a telescope. It is a fast spinning gas giant; its equatorial regions bulges outwards. The Great Red Spot is a huge, never ending storm, having been seen for the last 188 years. A 4 inch telescope is needed to see this feature. The king of the planets rises in the East at sunset over Oak Bay and Mount Baker, setting over the Sooke Hills in the West at dawn. Wait a few hours after sunset, when Jupiter is higher in the sky for the best views! If you viewed Jupiter last month, expect the view to be even better this month! Ganymede transits Jupiter May 14th. This is the largest planetary moon in the Solar System, larger than planet Mercury even. As it crosses Jupiter’s disc on May 14, it will be followed by its giant shadow at 18:00 PST. Unfortunately in Oak Bay, it will be too light to see. Venus is also stunning this month. It is visible low above the north-west horizon after sunset. If you are driving to the airport, it is low over Mount Newton to your left, following you from over the Malahat all the way to the airport – like the “Star of David”. It would be well worth driving your kids up Mount Tolmie before bedtime to see Venus. But please don’t forget your binoculars. As you watch the super-bright planet Venus, look for its accompanying star Aldebaran — the red “eye” of Taurus, the bull. Remember planets (the wanderers) are local to Earth inside our solar system, whereas stars are often full galaxies located light years away. These two star-like objects will appear to be separated by the width of your fist. While both objects will appear similar in brightness, you should be able to detect their distinct colors: bright white for Venus and orange-red for Aldebaran. This summary is from the transcript of “What’s Up in May 2018” by NASA announcer and astronomer Jane Houston Jones with specific permission for localization to Cattle Point DARK SKY Urban Star Park and the Oak Bay News. The Moon, Mars and Saturn form a pretty triangle in early April; the Lyrid Meteors are visible in late April, peaking high overhead on the 22nd. 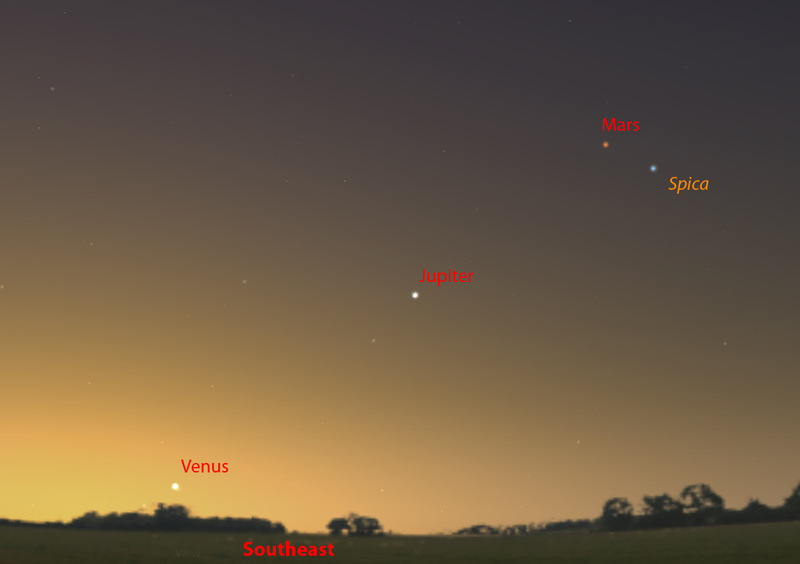 You won’t want to miss red Mars and golden Saturn in the South-southeast morning skies this month. Look towards Seattle. Mars shines a little brighter than last month. By the 7th, the moon joins the pair. From a dark sky you may see some glow from our Milky Way galaxy. Of course our solar system is located within the galactic disk, about 26,000 light-years from the Galactic Center where a giant black hole has been identified. Our solar system (the sun and planets) lies in the inner edge of the Orion Arm, one of the spiral-shaped concentrations of gas and dust. We used to think the galaxy was like a spinning wheel (firework). Now we know we see this spinning galactic “wheel” because we only “see” the visible light. But in fact the galaxy is a huge “dough-nut shaped” body – called a Torus. This shape seems to apply to so many “objects” in the Universe no matter how large or how small. Mid-month, start looking for Lyrid meteors, which are active from April 14 through the 30th. They peak on the 22nd. The Lyrid meteors are the dusty trail of a comet with a centuries-long orbit around the sun. As I like to remind the readers, the Earth passes through the tail every April. In the very early morning sky, a patient observer will see up to more than a dozen meteors per hour in this medium-strength Lyrid shower. A bright first quarter moon plays havoc with sky conditions, marring most of the typically faint Lyrid meteors. But Lyra will be high overhead after the moon sets at midnight, so that’s the best time to look for Lyrids. really pronounced “pareidolia” effect here in the north hemisphere, is much less obvious in Australia as our brains don’t create the compelling face when the moon is viewed upside down. Through a telescope, Jupiter’s cloud belts and zones are easy to see. Watch the Great Red Spot transit–or cross– the visible (Earth-facing) disk of Jupiter every 8 hours. The Juno spacecraft continues to orbit Jupiter. And Juno’s JunoCam citizen science team is creating exciting images of Jupiter’s features based on the latest spacecraft data. Next month Jupiter is at opposition, when it rises at sunset, sets at sunrise, and offering great views for several months! Summary is from the transcript of “What’s Up in April 2018” by NASA announcer and astronomer Jane Houston Jones with specific permission for localization to Cattle Point DARK SKY Urban Star Park and the Oak Bay News. 2018-3-1 : What’s Up in the Sky in March 2018? Both Venus and Mercury play the part of “evening stars” this month. on the next few evenings, March 21 through the 23rd. Jupiter, king of the planets, rises over Mount Baker just before midnight this month, and earlier by month end. Even through the smallest telescope or average binoculars, you should see the 4 Galilean moons, Europa, Io, Callisto and Ganymede. journey to the red planet, Mars will be easily visible to your unaided eye. Keep watching Mars as it travels closer to Earth. It will be closest in late July, when the red planet will appear larger in apparent diameter than it has since 2003! and the Milky Way intersect! The Zodiacal light is a faint triangular glow seen from a dark sky just after sunset in the spring or just before sunrise in the fall. The more familiar Milky Way is one of the spiral arms of our galaxy. What we’re seeing with the Zodiacal light, is sunlight reflecting off dust grains that circle the Sun in the inner solar system. These dust grains journey across our sky in the ecliptic, the same plane as the moon and the planets, what we call here in the Salish Sea Bioregion the “Salish Walk of the Planets”. I’d like to finish by highly recommending a palm size computer device called ISS-ABOVE. I echo Bill Nye’s comments. The hand sized computer connects to a TV allowing you to view LIVE HD video from the experimental cameras on board the ISS. Loads of information provided on your TV especially on when the next pass over your Oak Bay home is expected. The “real-time” HD video of the Earth below is wonderful. I was talking to them in Los Angeles telling them how much I liked it. They kindly gave me a promo code of “wesmith” that will drop the price of the ISS-Above by 10% to any Oak Bay News readers. The device is the amazing Raspberry Pi computer – there are hundreds of projects and experiments your grandchildren can do with this little computer that is sweeping the educational world. Well worth $135. 2018-1-1 : What’s Up in the Sky in January 2018? What’s Up for January 2018? The new year’s first meteor shower fizzles, Mars meets Jupiter in the morning sky, and Oak Bay will enjoy a total lunar eclipse! Most meteor showers radiate from recognizable constellations like the Leonids, Geminids and Orionids. But the Quadrantids are meteors that appear to radiate from the location of the former Quadrans Muralis constellation an area that’s now part of the constellation Boötes. The Quadrantids peak lasts for just a few hours, and sadly, this year their timing coincides with a very bright nearly full moon that will wash out most of the meteors. Throughout the month, you might see a few Anthelion meteors radiating from Gemini, Cancer or Leo. “Anthelion” meteor showers are variable, weakly-active minor showers. Surprisingly, you can look in any direction to see all the meteor showers. When you see one of these meteors, hold up a shoestring along the path it followed. The shoestring will lead you back to the constellation containing the meteor’s radiant point. All the meteors radiate from a single point in the sky. On the morning of January 6th look in the south-southeast sky over Seattle, 45 minutes before sunrise, to see Jupiter and fainter Mars almost as close as last month’s Jupiter and Venus close pairing. Mars is only 1/6th the apparent diameter of Jupiter, but the two offer a great binocular and telescopic view with a pretty color contrast. They remain in each other’s neighborhood from January 5th to the 8th. Two stellar occultations occur this month too. An occultation occurs whenever the moon (or other celestial object) passes in front of another celestial object such as a star, asteroid or planet. Leo’s white Regulus is occulted by the moon on January 4 and 5, visible from Southeast Alaska to the Maritime provinces of Canada. Taurus’s red star Aldebaran will be covered by the moon on January 27th, visible from Alaska, Canada and the Pacific Northwest. Finally, to end the month, a great total lunar eclipse favors the Western US, Alaska and Hawaii and British Columbia on January 31st. Australia and the Pacific Ocean are also well placed to see a major portion of the eclipse—if not all of it. There will be one more lunar eclipse this year, but it will be visible only from central Africa and central Asia. As a last topic I’d like again to encourage you to re-explore the Smartphone apps. Now in 2018 we have many great apps which instantly bring the night sky alive. 2017-12-1 : What’s Up in the Sky in December 2017? What’s Up for December 2017? The best meteor shower of the year and the brightest stars in familiar constellations. Don’t forget to take your grand children to the top of Mount Tolmie around 5pm on Christmas Eve. Pyjamas are allowed (for the kids) as long as you stay in the car. Santa Claus or The International Space Station or both should be seen if you are lucky. The Geminds peak on the morning of the 14th, and are active from December 4th through the 17th. The peak lasts for a full 24 hours , meaning more worldwide meteor watchers will get to see this spectacle. If you can see Orion and Gemini in the sky you’ll see some Geminids. Expect to see up to 120 meteors per hour between midnight and 4 a.m. but only from a dark sky. You’ll see fewer after moonrise at 3:30 a.m. local time. Take a moment to enjoy the circle of constellations and their brightest stars around Gemini this month. Find yellow Capella in the constellation Auriga. You should be facing South towards the Olympic Mountains and Port Angeles. Going clockwise–at 3 o’clock find Taurus and bright reddish Aldebaran, plus the Pleiades. At five o’clock, familiar Orion, with red Betelgeuse, blue-white Rigel, and the three famous belt stars in-between the two. Next comes Leo, and its white lionhearted star, Regulus at 10 o’clock. There’s a second meteor shower in December, the Ursids, radiating from Ursa Minor, the Little Dipper, in the North over Mount Douglas. If December 22nd and the morning of December 23rd are clear where you are, have a look at the Little Dipper’s bowl, and you might see about ten meteors per hour. The Ursid meteor shower . The radiant point is just below Polaris the North Star high above the University of Victoria. The late evenings of the 22nd and 23rd of December are when the Ursid meteor shower will be at its best – though the peak rate of ~10-15 meteors per hour is not that great. Pleasingly, the Moon soon after new, will not affect our view during much of the night. 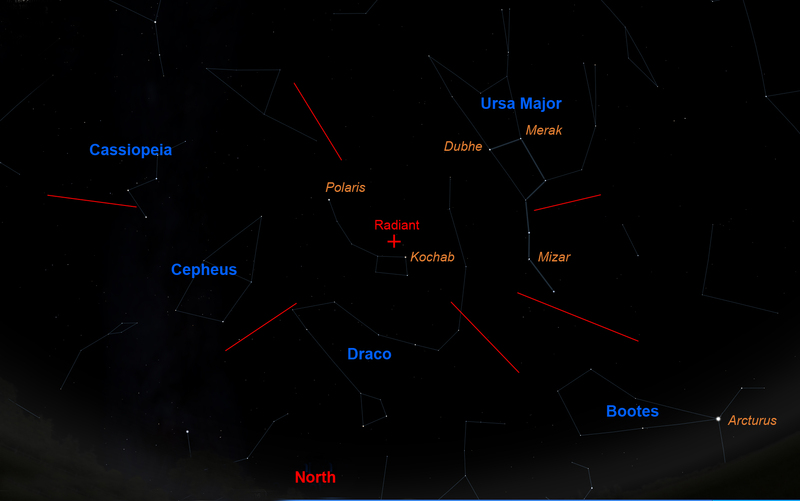 The radiant lies close to the star Kochab in Ursa Minor (hence their name), so look northwards at a high elevation. Occasionally, there can be a far higher rate so its worth having a look should it be clear. There are so many sights to see in the sky. Use the Night Sky Network, the Solar System Ambassadors, and the Royal Astronomy Club of Canada (Victoria) to look up local astronomy clubs, and join them for stargazing events in town, and under dark skies. Mars, Jupiter and Venus climb the “Salish Walk of the Planets” with Mars rising first, then Jupiter and then Venus. The SUN comes quickly behind. As we all know, the planets, just like the Sun, rise in the East over Mount Baker, and set in the West over Metchosin and the Sooke Hills. They walk across the sky in a huge arc which ends in the West over Sooke Hills. To spot Venus, a very low horizon will be needed so waterfront owners on Oak Bay will be well positioned facing East across the Salish Sea. Locals can also go to Cattle Point Star Park or even up Mount Tolmie. 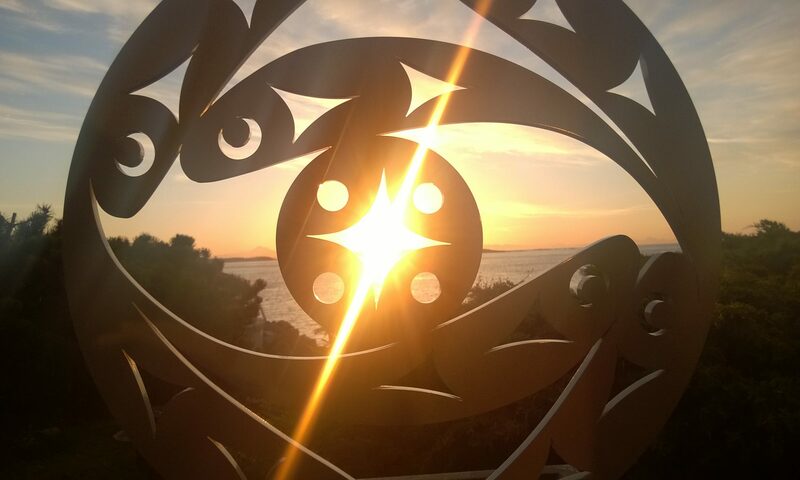 Great views of the Salish Sea horizon from both locations. Use binoculars – but please to not use them after the Sun has risen. The chart has reduced the sky brightness to make Venus visible. to Cattle Point DARK SKY Urban Star Park and the Oak Bay News. 2017-11-1 : What’s Up in the Sky in November 2017? Title: What’s Up For November? The moon passes three pretty star clusters, a close conjunction of Venus and Jupiter, sparse meteor showers, and one comet! Your binoculars will come in handy this month, to view the moon, star clusters, and the close pairing of Venus and Jupiter. You can’t miss bright Venus in the predawn sky. This month Venus pairs up with Jupiter on the morning of November 13th, as they did in 2015 and 2016 when the two planets appeared a little closer than this year. You’ll have to be looking very low on the east-southeast horizon over Seattle early in the morning around 07:00 am – about 45 minutes before sunrise – but protect your eyes! Don’t aim your binoculars directly at the sun and don’t look at the approaching sunrise with your unaided eyes or binoculars or telescopes. There are three meteor showers this month, but none of them will present high numbers of meteors at their peak. The Leonids peak on a moonless November 17th. Expect no more than 10 meteors an hour around 3:00 a.m., the height of the shower. The nearby November Orionids peak on the 28th. In contrast to the nearby Taurids, the Orionids are swift, but don’t expect more than 3 meteors per hour. The moon glides by three beautiful star clusters in the morning sky this month, and a pair of binoculars will allow you to see the individual stars in the clusters. Aim your binocs at the Pleiades and moon on the 5th, Messier or M-35 cluster and the moon on the 7th and the Beehive cluster and the moon on the 10th. Meanwhile, at dusk, catch Saturn as it dips closer to the western horizon, over the Sooke Hills this month, and pairs up with Mercury on the 24th through the 28th. magnitude 7-8 greenish object in November. Use Polaris, the North Star as a guide. Look in the East to Northeast sky over Vancouver, in the late evening. which shows you the time each planet is Visible in the Night Sky in Oak Bay, British Columbia, Canada. Remember all planets walk from east to west during the night, just the same as the SUN and Moon, moving along an arc in the sky that we call “The Salish Walk of the Planets” – or the “ecliptic”. All the rest of the stars and galaxies rotate around the North Star over #YYJ, the Victoria Airport. As a last topic I’d like to encourage you to re-explore the Smartphone apps. Now in 2017 we have many great apps which instantly bring the night sky alive. So if you have internet access with your phone from a place like Cattle Point Dark Sky Star Park, there is no better experience than exploring the night sky on a calm clear evening. you see a bright object over Vancouver then you point your phone towards it and the constellation image is named and re-displayed for you to compare with the wonder of the “real” sky. It is brilliant to have this instant expert helping you name each object in the sky. 2017-10-1 : What’s Up in the Sky in October 2017? Title: What’s Up For October? Planet Pairs, Stellar Superstars, Observe The Moon Night!! What’s Up for October? International Observe the Moon Night, planet and moon pair-ups, and a meteor shower! You can’t miss bright Venus in the predawn sky over Mount Baker. Look for fainter Mars below Venus on the 1st, really close on the 5th, and above Venus after that. 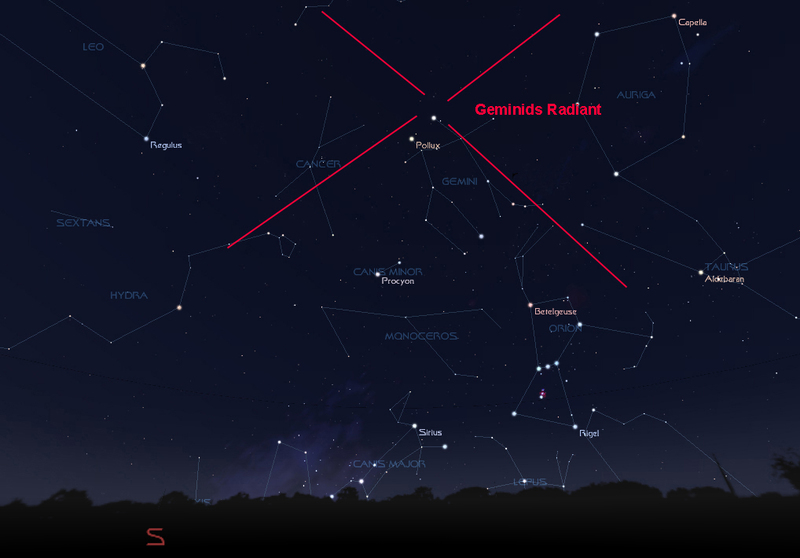 Mid-month, the moon is visible near Regulus, the white starry heart of the constellation Leo. October 13, the Moon and M44 will make a close approach, passing within 2°53′ of each other. The Moon will be 23 days old. “M44 aka the Beehive Cluster, is an open cluster in the constellation Cancer. It is one of the nearest open clusters to the Solar System, and it contains a larger star population than most other nearby clusters. Under dark skies the Beehive Cluster looks like a nebulous object to the naked eye; thus it has been known since ancient times. The classical astronomer Ptolemy called it “the nebulous mass in the breast of Cancer,” and it was among the first objects that Galileo studied with his telescope” see Wikipedia. From Victoria (click to change), the Moon and M44 will be visible in the dawn sky, rising at 00:43 (PDT) – 6 hours and 48 minutes before the Sun – and reach an altitude of 57° above the south-eastern horizon before fading from view as dawn breaks at around 07:10. After dusk in the early part of the month look for Saturn in the southwest sky over Metchosin. It will be above another red star: Antares in Scorpius. Later in the month, find the moon above Antares October 22 and 23. Uranus reach opposition on October 19th. It’s visible all night long and its blue-green color is unmistakeable. It may be bright enough to see with your naked eye–and for sure in binoculars. Don’t forget each night, all the planets walk across the sky on a 12 hour night walk following the path of the Sun and Moon – from East to West along the ecliptic. In Oak Bay we call this path the Salish “Walk of the Planets”. Milky Way Stars and other Galaxies move differently, rotating each night around the North Star. The Orionids peak on October 20 — a dark, moonless night. Look near Orion’s club in the hours before dawn and you may see up to 10 to 15 meteors per hour. Use binoculars to look for bright asteroid 7 Iris in the constellation Aries. Newbies to astronomy should be able to spot this magnitude 6.9 asteroid. Look later in the month and sketch its positions a day or two apart–to see it move. Finally, celebrate International Observe the Moon Night on October 28 with our RASC (Royal Astronomy Club). The first quarter moon that night will display some great features! This article is from Oak Bay News in October 2017. 2017-9-1 : What’s Up in the Sky in September 2017? What’s Up for September 2017 ? Set your sights beyond the solar system and take a late summertime road trip along the Milky Way! On September 15 the Cassini spacecraft ends its glorious Saturnian science tour by plunging into the atmosphere of Saturn, becoming forever a part of the ringed planet. This web page is a copy of the article printed by Oak Bay News. Over the next few days, a huge Asteroid known as 3122 Florence will be traveling roughly south to north, crossing through the constellations Capricornus, Aquarius, Delphinus, Vulpecula, and Cygnus. Above and below Saturn–from a dark sky–you can’t miss the summer Milky Way spanning the sky from Vancouver in the northeast to Sooke in the southwest. Cygnus the Swan is where the Kepler telescope focussed its search for exoplanets. For a long time I wondered why it was pointing in this direction. Then I finally realized it was pointing along the plane of the galaxy along a spiral arm where the density of stars was high – but not directly at the centre of the galaxy. It was a good choice. As you gaze toward the northeast you’ll see Cassiopeia, the familiar W-shaped constellation…and Perseus. Through your binoculars, look for the Perseus Double Cluster. Both of the clusters are visible with the naked eye, are 7500 light years away, and contain more than 300 blue-white super-giant stars! P.S. I was in Tuscany August 21 , 2017 and sadly missed the eclipse. But here is a special photograph to commemorate the event which I trust was awesome for you.